Robert Martineau and his wife Jane Smith (d.1874) were the progenitors of the Birmingham branch of the remarkable Unitarian and liberal Martineau family. Robert was the son of Thomas and Elizabeth Martineau of Norwich and was one of eight siblings. These included Thomas, a well-known eye surgeon, the Rev. Professor James Martineau, a renowned Unitarian theologian, philosopher and academic and the famous (some of her critics would have said infamous) Harriet Martineau, a prolific and controversial author, journalist, economist and social scientist. Robert and his colleague Brooke Smith began the firm of Martineau and Smith in the 1820s, possibly as cotton importers, but the source of the family prosperity came from their success in 1830s Birmingham as brass founders, manufacturers and traders. Martineau and Smith subsequently had a continuous existence for over a century. 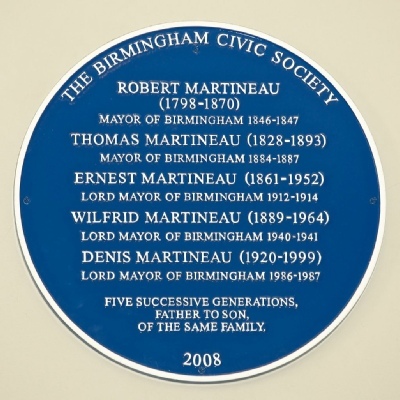 Robert began the Martineau tradition of public service in Birmingham which included five generations of Mayors and Lord Mayors (a Blue Plaque in the Council House commemorates this achievement). As a liberal he became politically active in the 1830s and was involved in the great Birmingham radicalisation that secured the 1832 Reform Act and as a Unitarian dissenter assisted in the freeing of the City from Church Rates. He was also active in the 1840s Birmingham Anti -Corn League. Following the Municipal Corporations Act of 1835, Birmingham progressed in 1838 from local government by nominated Street Commissioners to elected Councillors. 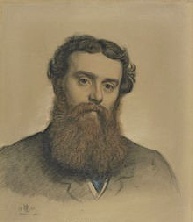 Robert served latterly as a Commissioner and then became Councillor for the Edgbaston ward from 1842. It is a mark of his zeal and ability that by 1846 he was made Mayor of the City and then an Alderman until his retirement due to ill health and near blindness in 1856. During this time, he was an active Magistrate and was connected with various public institutions and charities including the new General Hospital, the Music Festival in the new, now iconic, Town Hall, Bailiff of the alms houses of Lench’s Trust and his work in establishing the Edgbaston Proprietary School of which his son Thomas was the first pupil entered. Robert died in 1870 in the house that he built for his large family in Highfield Rd, Edgbaston. The house still stands and is now an hotel. Robert Martineau is buried in Key Hill cemetery in Grave site I 790 along with his mother Elizabeth, his wife Jane, his sister Harriet and his children Robert, Marie and Susan. Other members of his family are buried close by in K134.